If Lades, which means “wishbone” in Turkish, provided an actual wishbone alongside the usual post-meal wet wipe and toothpick, we’d close our eyes and make a wish that we could eat their tandır (oven-roasted baby lamb) seven days a week. These large knots of tender, fragrant meat lined with a soft cushion of fat are the sort of high-calorie lunch that we might save for a special occasion but Lades regulars take for granted. Lades is an old school spot, a classic local lokanta serving stews and steam table favorites day in, day out. The monogrammed flatware, faded from decades of use by diners sopping up that last bit of stew with a fresh piece of white bread, indicates the sort of customer approval that we seek in a lunch spot. On one recent visit, we tried the hotpocket-like talaş kebabı – a stew of beef, carrots, currants, onions and pine nuts wrapped in phyllo dough. With a bowl of lentil soup, a side of okra and, for dessert, kazandibi (“burnt pudding”), we discovered that just about everything at Lades is highly soppable and dependably good. Indeed, if Lades were an automobile, it might be an old Volvo station wagon – nothing exotic, but safe and extremely reliable. (Equally dependable is the highly recommended, diner-like Lades 2 across the street, which serves eggs and puddings.) “Most of our customers are regulars. They know exactly what is served on which day of the week. How could we possibly change anything?” said manager İlker Bey from his post at the register. As it is written (on the window out front), on Mondays and Thursdays you shall eat döner kebab in succulent ribbons served over rice. Tuesday is a day for Arnavut ciger, lightly fried lambs liver ramped up with red peppers. Smothered okra, spinach with rice, roast chicken, various stews and our beloved tandır kebap are available everyday but Sunday, when the restaurant is closed. They may be dependable, but even the guys at Lades deserve a day of rest. Oh, once again, I read your post and want to be in Istanbul again RIGHT NOW. Thanks for making a cold day in Boston taste like Beyoglu today. This makes my mouth water … but I couldn’t find the street on my city plan of Istanbul. Are you sure the name is correct ? And, by the way, could you possibly write Turkish names in the original alphabet, i.e. retaining the difference between “s” and “sh”, &c ? Thanks in advance. Hi. The name and address are correct. It is located just off Istiklal. If you are coming down from Taksim, make a left when you reach the mosque on Istiklal (there is only one). Enjoy. Lades is great; not only has it maintained its quality but also the prices, while several other well-known places have done neither, cheapening the product and offering little more than their old reputation. I hope it will stay around for a long time to come. 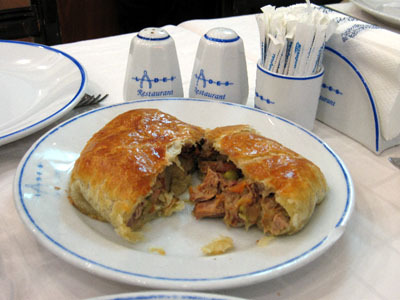 The börek place next door is also very good; no skimping on the filling and their tea is always great. I believe the old name of Sadri Alışık Sokak was Ahududu Sokak; sometimes old names continue to appear on maps long after the name has changed. Just a brief note/correction about talas borek mentioned above: it is puff pastry not phyllo dough. This makes me want to go back to Istanbul so much! !